The Amish Gilbertson Bluebird House is designed to invite sweet bluebirds in while discouraging the more aggressive sparrows from landing. House sweet bluebirds in this quaint bluebird house. The design utilizes a rounded shape that resembles a birch tree. This is not attractive to sparrows who prefer to feed on the ground or from large platform feeders. 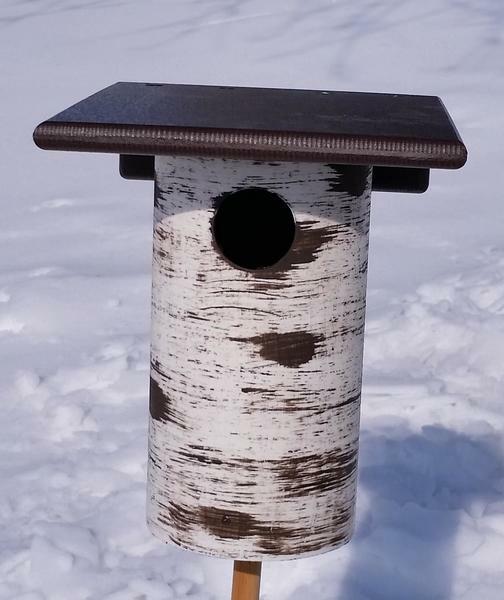 The Amish Gilbertson Bluebird House has a round birch-like log bottom and a strong squared top made of eco friendly poly (recycled plastic). Measures 8" by 9" by 12"
Thank you for shopping with DutchCrafters. We appreciate your business. Please email or call us with any questions. Questions@DutchCrafters.com or toll-free at 866-272-6773. The Most Sparrow Resistant Bluebird House on the Market.